SHOULD I ADVERTISE OR SPONSOR? As you look back on the 1st quarter of 2014, are you happy with how your Marketing dollars have been spent? Do you feel as though they served your business well? If not, I’d like to take a minute and reiterate the power of Marketing and Advertising, specifically through the West Orange Chamber of Commerce (WOCC). 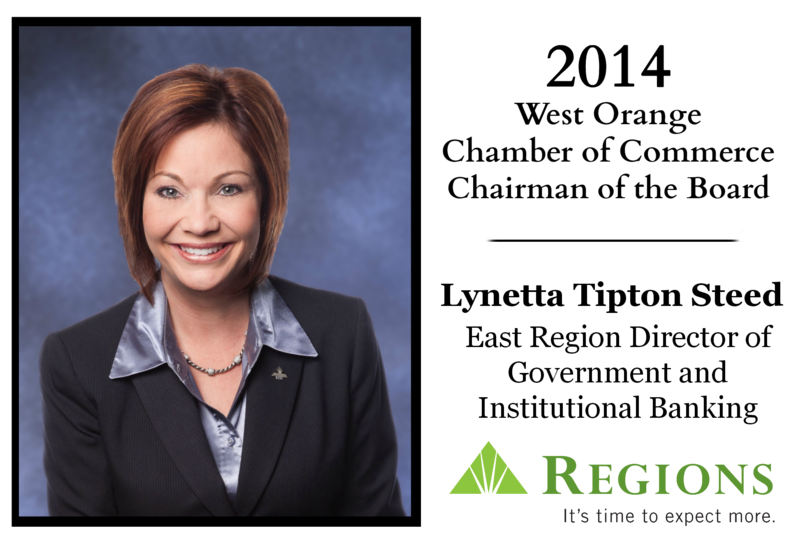 Through Chamber Sponsorships and Advertising, you are reaching a very select group of individuals who have already invested in helping to grow the local business community. What more could you ask for than a targeted demographic of people that WANT to do business with you? Whether you choose to advertise at wochamber.com, in an e-publication such as this one or through sponsorship of a Chamber event, you know that your Marketing dollars are being well spent. Sponsorship is more like a dialogue. Sponsorships helps to accomplish qualitative attributes, such as increasing awareness of your company to a targeted and engaged group. Live Audience Interaction - Spending several hours with clients and potential clients or customers away from distractions of the office or business is invaluable. Events make great settings for informal networking and sales. Product Showcasing - Your product or service can be used or showcased at the event for increased awareness. For example, branded clothing may be worn at the event, equipment showcased, food sampled, etc. Advertising is like a monologue. Advertising, on the other hand, holds just as much power and prestige as Sponsorships. Advertising offers quantitative benefits that allow you to showcase and even track a specific message, product line or upcoming event. Brand Awareness – studies have shown that the more people see your business name, the more comfortable they feel with your business or products. Vested Interest – your advertisements show that you are investing in the local business community and that message resonates in the consumers’ mind and builds loyalty within a targeted group that supports one another. As you roll full steam ahead toward the busy summer season, make the commitment today to invest your marketing and advertising dollars through the West Orange Chamber. I know the WOCC staff is confident that you will find success through whichever avenue you choose. Sponsorship opportunities with the Chamber can be downloaded here or feel free to download the digital media kit here. You can also view testimonials from some of our Members who have included the Chamber in their Marketing strategy here. Please join us in welcoming our NEW members of the West Orange Chamber of Commerce! 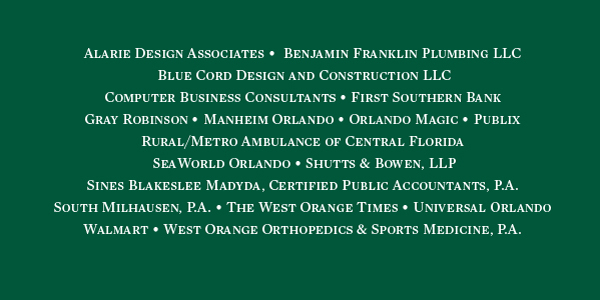 We encourage you to welcome these new members and show your support by visiting their websites, stopping by their businesses and utilizing some of their services and products. 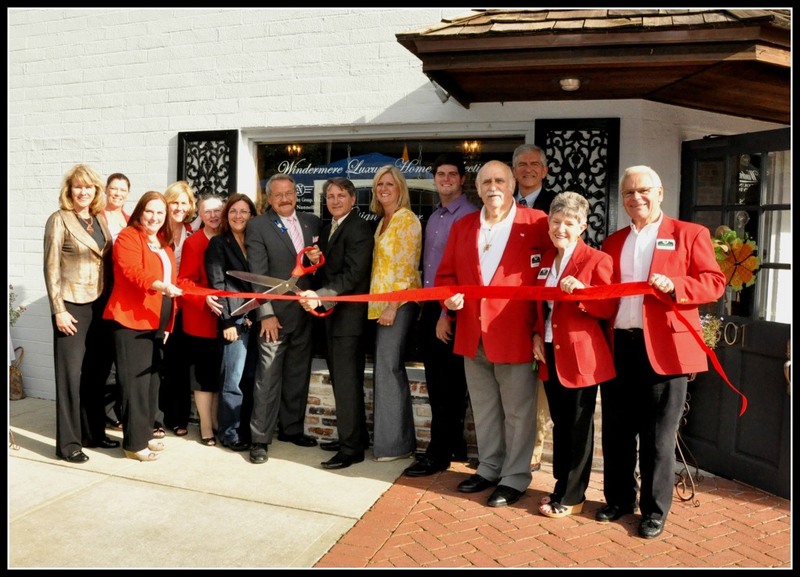 Established in 1974, Sines Blakslee Madyda is West Orange County’s oldest and most experienced accounting firm, providing their clients with a combined total of over one hundred years of experience. That experience means their clients receive the very best technical expertise, counsel and representation. 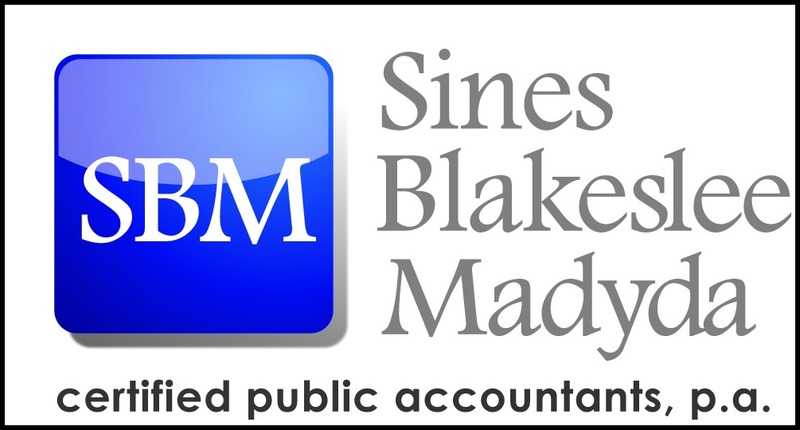 Because of their years of experience, Sines Blakeslee Madyda provides unequalled service to their clients, including: Audits, Reviews & Compilations, Tax Planning and Preparation, Bookkeeping Servives, Computer Consulting, Management Advisory Services, IRS Examination Representation, Estate Planning, New Business Services, Fraud Examination and Litigation Support. Chamber Member, Kim Herring, co-owner of Garage Mama Fitness, won an EXPY from The National Association or Experts, Writers and Speakers in New York. Kim, a former NFL Safety and Super Bowl Champion, was featured in the April Men's Fitness Magazine as part of a feature called "World Fitness Elite: GameChambers. Read the entire press release here. West Orange Chamber Member, Harmony Tech, recently earned the spot at the #3 social media marketing firm in Central Florida by the Orlando Business Journal. With over 47 active social media accounts, including Facebook, Twitter, Instagram, LinkedIn, Pinterest, Vine, Tumblr, SnapChat, Google , Jelly, Yelp, Trip Advisor and YouTube (to name a few) - they are definitely a leader in their field! Freshman Member, The Pur Clinic, will soon depart for two day, marathon drive from Florida to New York City, all in the name of mens health. The DRIVE FOR MEN'S HEALTH will traverse over 1,100 miles, in 1 car (an all electric Tesla) complete with live interviews and real world talks about important health issues. 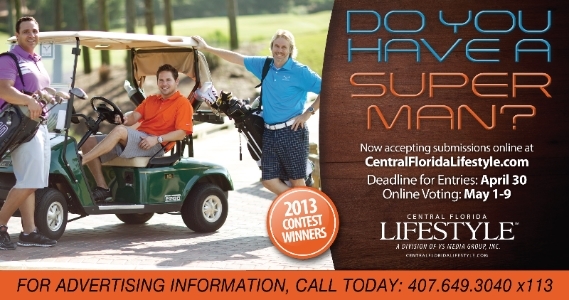 View the flyer or follow them on Twitter at @thePURClinic or #Drive4MensHealth. Congratulations to City of Ocoee employee Dean Hall for his recent election as president of the Central Florida Building Officials Association. 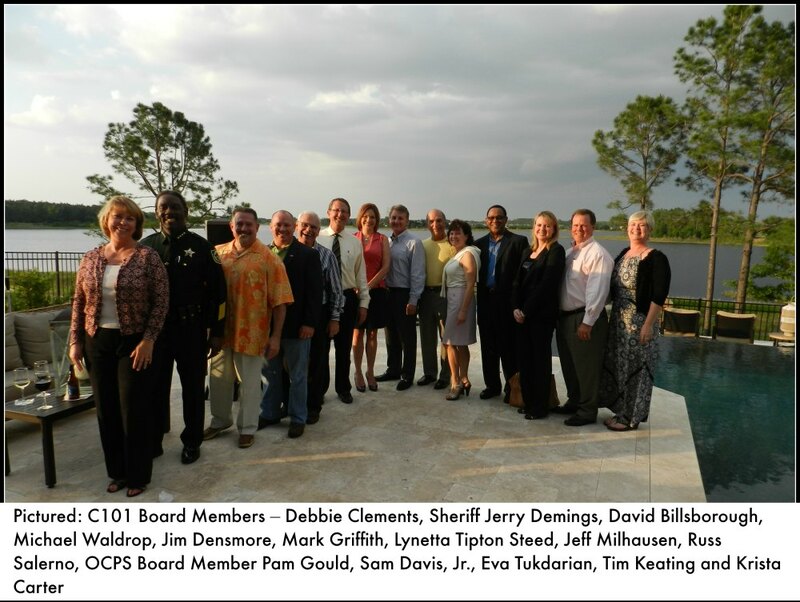 The Central Florida Building Officials Association is comprised of 125 members consisting of building officials, deputy building officials, plans examiners and inspectors from public and private organizations. Hall is the city’s Deputy Building Official, Plans Examiner/Inspector and has been with the city for 10 years. Congratulations to the OCPS Teacher of the Year, Kristin Iannuzzi and Support Person of the Year, Deloris Patterson, both of whom came from West Orange schools. We are excited to announce the Orange County Mayoral Debate Luncheon featuring Mayor Jacobs and Val Demings. This event, presented by Series Sponsor Florida Hospital, is scheduled for Thursday, June 26, 2014, 11:30am – 1:30pm at the Valencia College Special Events Center -West Campus. Accompanied by Event Sponsors Walt Disney World and University of Central Florida, the luncheon will feature a debate moderated by Mr. Fred Kittinger, UCF Associate Vice President University Relations, between current Orange County Mayor Teresa Jacobs and Val Demings. “The West Orange Chamber of Commerce is proud to facilitate this event”, stated David Sylvester, Chairman of the West Orange Chamber Economic & Governmental Advocacy Committee, “Both Candidates call West Orange County home and what better way to educate their neighbors on their political platform than an open public debate.” For more information on event sponsorship or to purchase tickets contact the Chamber office at 407-656-1304. The West Orange Chamber of Commerce has been spearheading an initiative along West Colonial Drive from Pine Hills Road to Apopka Vineland Road to retain existing retail businesses and allow for redevelopment. This effort is being coordinated with County Commissioner Tiffany Moore Russell and supported by Commissioners Boyd and Brummer. 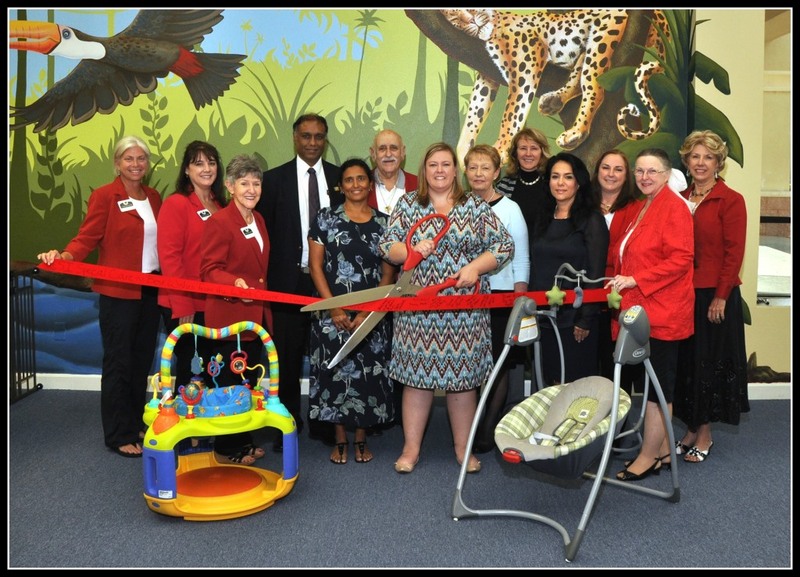 Tim Haberkamp, Chairman of the Pine Hills Neighborhood Improvement District and West Orange Chamber of Commerce board member has also been instrumental in moving this forward. After just one meeting in January of this year, several key issues were identified and targeted for solutions. A HUGE Thank You goes out to the renewing businesses below. We will continue to work diligently to promote, educate and facilitate opportunities for you. We know everyone’s schedule doesn't allow them to attend Business After Hours, so the West Orange Chamber now offers a way to 'kick' start your morning prior to the workday with Business Before Hours. It is designed to offer an innovative approach with 50% networking and 50% educating our Members. 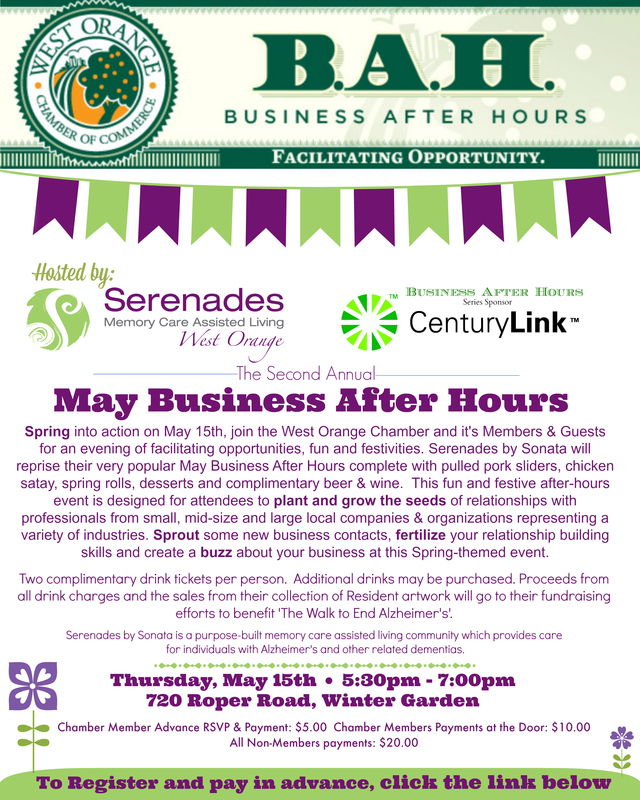 Join us as we hear from George Aguel, President/CEO of Visit Orlando. George will highlight the role of VisitOrlando,the official tourism association for Orange county, the most visited destination in the United States., and how local businesses can plan benefit from the Tourism industry. 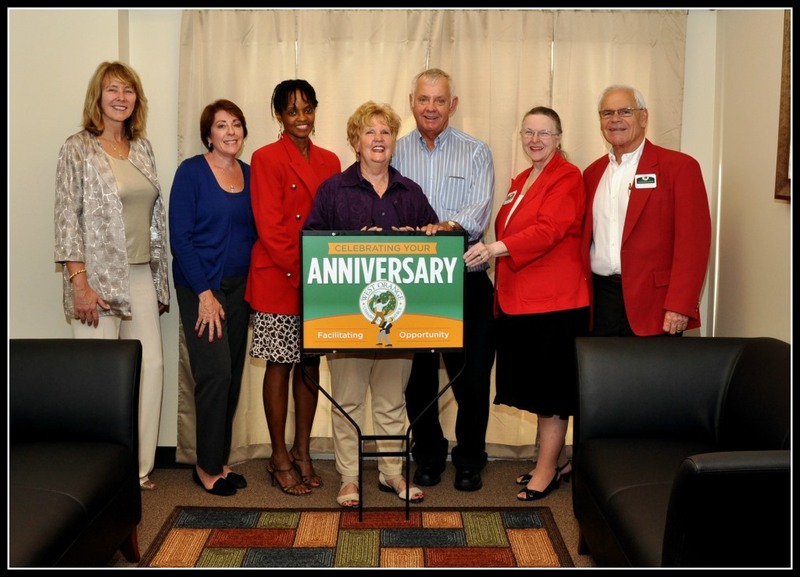 Thursday, May 1st – 5:30pm – Anniversary – Ocoee Chiropractic & Injury Center - 109 Terra Mango Loop, Suite B, Orlando. Tuesday, May 6th – 5:30pm – Ribbon Cutting – Dreamz2Go Travel - 462 West Plant Street, Winter Garden​. 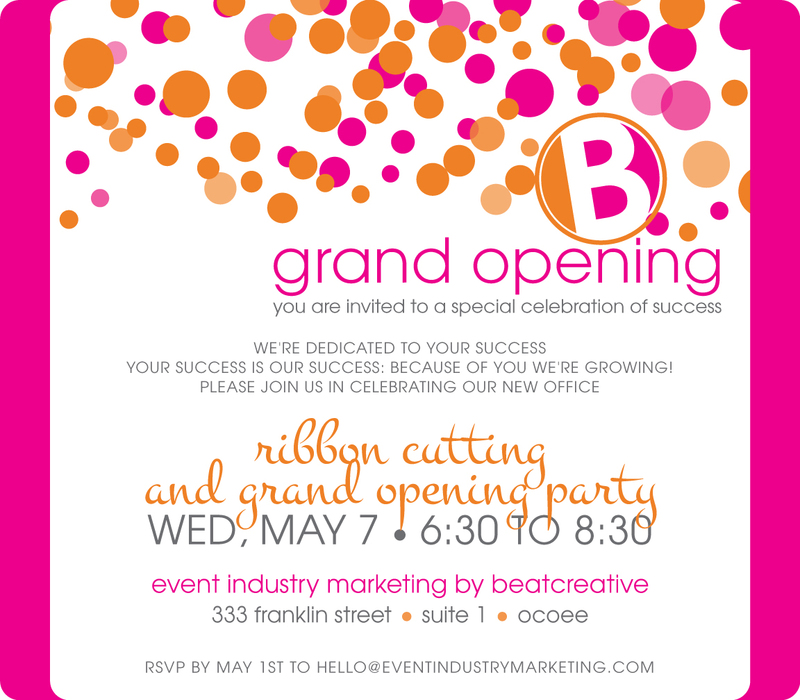 Wednesday, May 7th – 5:30pm – Ribbon Cutting – Event Industry Marketing by BeatCreative - 333 W. Franklin Street, Suite 1, Ocoee​. Tuesday, May 20th – 5:30pm – Ribbon Cutting – UF Health Cancer Center – Orlando Health - 1111 Blackwood Avenue, Ocoee. The Leadership West Orange Class of 2014, “Leadership on Fire” sponsored by, Florida Hospital, attended their last class on April 16. 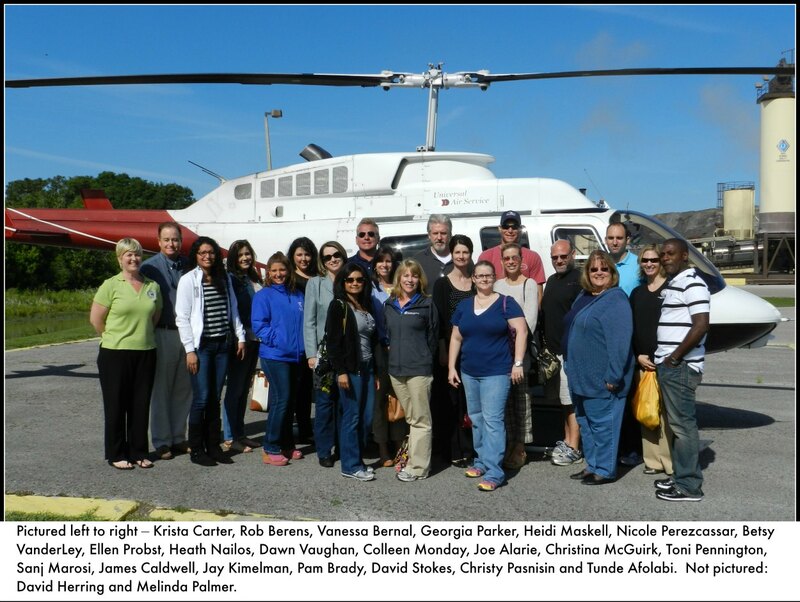 The group had the opportunity to take a helicopter ride over West Orange County and then participate in a scavenger hunt that spanned across West Orange County. The Class will have an official Graduation Ceremony on June 26 in conjunction with the Orange County Mayoral Candidate Debate. 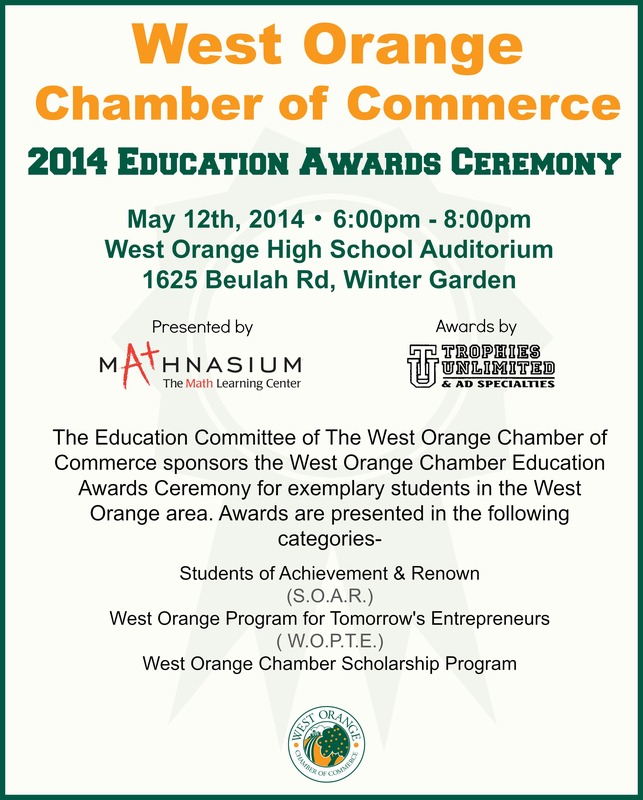 Copyright © 2014 West Orange Chamber of Commerce, All rights reserved.